Today is a recipe on how to make "Banana Cupcakes with Browned Butter Frosting (Gluten Free)". 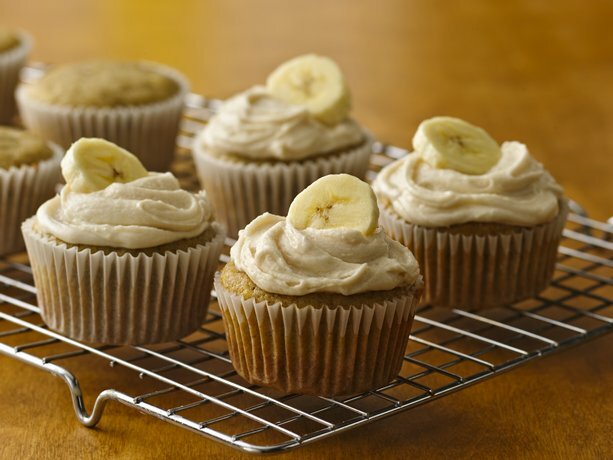 I adore Banana baked goods and I think this cupcake recipe is so simple and extra yummy! Check out the recipe below.. Ripe bananas? Mix them with Betty Crocker® Gluten Free yellow cake mix and create delicious homemade cupcakes. Heat oven to 350°F. Place paper baking cups in each of 17 regular-size muffin cups. In large bowl, stir cupcake ingredients just until dry ingredients are moistened. Spoon batter evenly into muffin cups. Bake 16 to 18 minutes or until toothpick inserted in center comes out clean. Remove from pan to cooling rack. Cool completely, about 30 minutes. In 1-quart saucepan, heat 1/3 cup butter over medium heat just until light brown, stirring occasionally. (Watch carefully because butter can burn quickly.) Remove from heat. Cool slightly, about 5 minutes. In medium bowl, beat butter, powdered sugar, vanilla and enough milk until smooth and spreadable. Spread frosting over cooled cupcakes. *Do not use margarine or vegetable oil spreads. Beurre noisette is the French term for “browned butter,” referring to butter that becomes light hazelnut in color during cooking. The wonderful, unforgettable, one-of-kind flavor has no equal or substitution.